The Northern Late Model Racing Association is returning to the Greenbush Race Park in Greenbush, MN on Saturday night, June the 14th, after nearly three years away. The series continues on to the Buffalo River Race Park near Glyndon, MN on Sunday night, June the 15th. The event at Greenbush is scheduled to be the 21st appearance by the series at the track. Unfortunately the track, which opened in 1991, remained closed throughout the 2012 season. But weekly racing did return to the three-eighths mile dirt oval last season. The tracks' long straightaways and tight corners produce some of the closest racing on the NLRA calendar. Mike Balcaen, was Greenbush's inaugural late model track champion in 1991, and has since added two NLRA series victories to his resume at the track. Tom Corcoran is the only other series regular to have multiple NLRA wins under his belt in Greenbush, as he also has two wins to his credit. Joey Pederson, Brad Seng, and Troy Schill also own series victories there. Pederson's win was during the series last visit to the speedway in August of 2011. The hard chargers were Bill Mooney and Greg Ferris, with each passing eight cars to round out the top five with fourth and fifth place finishes respectively. Racing on Saturday night begins at 7pm. Last seasons' NLRA event at the Buffalo River Race Park near Glyndon, MN was won by Zach Johnson, who defeated Dustin Strand for the third of his four series victories last season. Strand's performance was won of his nine runner-up finishes that went a long way towards his winning of the 2013 NLRA series championship. Brad Seng, Mike Balcaen and John Kaanta, who started 24th rounded out the top five. Sunday's racing begins at 6pm. 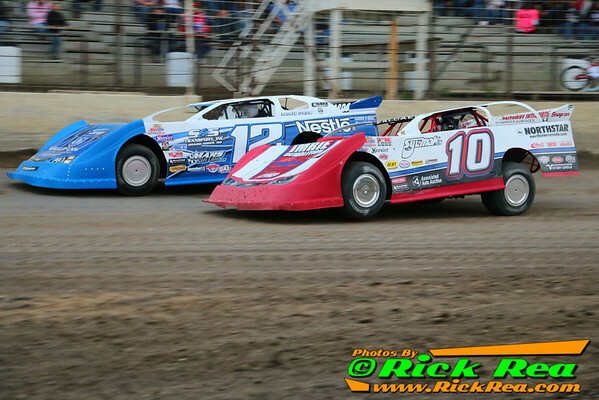 Brad Seng (12) and Mike Balcaen (10) racing at River Cities Speedway on June 6. Photo courtesy of Rick Rea.